The MMA world has heard plenty about CBD in recent times, with ex-fighters commenting favorably about the cannabis derivative, and current fighters including Nate Diaz speaking out about the benefits for pain relief and inflammation. But the therapeutic effects of CBD do not stop there, with research showing that the compound could be an effective weapon against neurodegenerative diseases, and a potent antidote for mental health disorders such as anxiety and depression. When cannabis activists talk about the plant being a potential remedy for all kinds of illnesses, even those that seemingly have no connection with each other, it’s only natural for alarm bells to ring. In today’s world, everyone seems to be looking for quick fixes, and scammers have certainly tried to exploit such naivety. However, when it comes to CBD, the naïve stance is to ignore the remarkable possibilities of this cannabis component, just because it comes from an herb that American society has stigmatized for almost 100 years. In this post, we will clarify the differences between CBD and THC, the two most important cannabinoids in cannabis, and detail how the World Anti-Doping Agency (WADA) considers these substances. We will also introduce the endocannabinoid system that cannabinoids function in, and the role that this network has in keeping the body healthy. Most people who get caught up in cannabis scare stories are not aware of the differences between cannabidiol (CBD) and delta-9-tetrahydrocannabinol (THC). Both are part of a chemical class known as cannabinoids and operate in the endocannabinoid system. While both have important medicinal properties, it is the potential psychological side effects of THC that have been seized upon by anti-cannabis forces in the media and beyond and used to dismiss the entire plant. It is true that THC is a psychoactive substance, and in sufficient doses can have mind-altering effects. This isn’t necessarily a bad thing, with millions of people around the world using cannabis sensibly in a recreational scenario, without it being to the detriment of their mental health. However, some do find that THC increases anxiety or paranoia – the euphoria that comes from regular large doses can also become mentally addictive over time. But CBD does not create any of these psychoactive effects and has no risk of doing so because it does not make the crucial bind that’s required with CB1 receptors in the brain. CBD and THC interact totally differently with the endocannabinoid system. While THC is effectively a substitute for the endocannabinoid anandamide (THC hijacks the CB1 receptors that anandamide would otherwise connect to), CBD’s interactions are relatively indirect. Instead of mimicking endocannabinoids, CBD ensures that chemicals like anandamide are present in levels that allow the endocannabinoid system to function as it should. For example, CBD can potentially help patients with depression by boosting anandamide levels and directing this endogenous antidepressant to the brain. 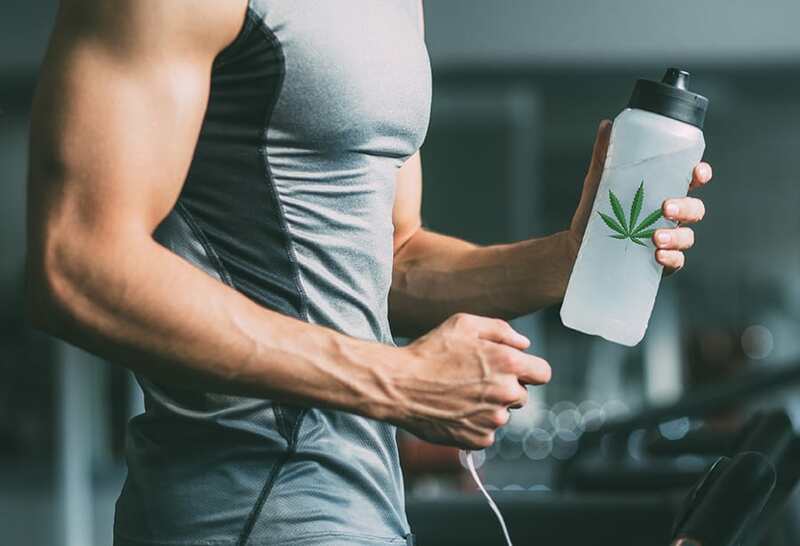 With demand for CBD rising among athletes in multiple sports, WADA has been forced into readdressing its stance on cannabis and the compounds found in the plant. In September 2017, WADA released its list of prohibited substances effective from 1 January 2018, with cannabidiol (CBD) being removed from the list for the first time. However, the rest of the plant, including THC, remains banned. But with the advent of CBD-specific products such as CBD capsules, MMA fighters can now use a safe, non-addictive medicine – as opposed to opioid painkillers – without being in danger of failing a drugs test. This is a huge step forward for medical cannabis use in sports, although not the end. Despite being psychoactive, THC does contain some unique medicinal properties that should not be ignored. The endocannabinoid system may be obscure, but the influence it has over physical and mental health, as well as the speed of recovery, is undeniable. Pain sensation and inflammation are two key functions – as far as MMA fighters are concerned – that are regulated by this system of endocannabinoids and receptors. Because the endocannabinoid system was unheard of until the early-to-mid-1990s, health and medical professionals have paid little attention to it, and there is a lack of literature on how we should regulate it. However, those peculiar cannabinoids from the cannabis plant can do just that. When you think about it, this is understandable. Only in recent decades has society been taught to view cannabis negatively (it is after all prohibited in most countries). But cannabis featured regularly in ancient Chinese medicine, had a rich history in ancient Egypt and has also popped up in Ayurvedic medicine texts. The human-cannabis relationship runs deep, as this 2013 study in Front Psychiatry details, with the endocannabinoid system first appearing in life forms as long as 600 million years ago. Researchers are yet to fully agree on what makes CBD great for pain relief, but it could be that the cannabinoid’s effects extend beyond the endocannabinoid system. Studies have shown that anandamide can bind to the TRPV-1 (vanilloid) receptor. The vanilloid receptor is known to regulate the body’s sensitivity to pain. It could be the case that CBD promotes anandamide by blocking the FAAH enzyme, which is then directed to this receptor. The endocannabinoid system influences the immune system, primarily through the CB2 receptor. Studies have found that CBD activates this receptor more than other cannabinoids. It may be more efficient to treat inflammation with CBD-infused topicals, that can directly influence cannabinoid receptors in the skin. There are a multitude of ways to take CBD, but CBD pills have certainly grown in popularity of late, perhaps because of their similarity to conventional, modern medicine. These capsules are infused with CBD oil which is then released into the bloodstream as if it were an edible. The CBD takes around an hour to get into the bloodstream, depending on metabolism rate, but the effects can last for six hours or more. For those who find the hempy flavor of CBD oil unpleasant, CBD capsules help to hide the taste. The pills come in a bottle and are therefore discreet. Capsules are available in a variety of strengths, so can be effectively used by both first-time CBD users and seasoned partakers. The benefits of CBD are clear, from the anecdotal stories and the accompanying scientific evidence. And the MMA is a perfect example of an industry which has raised awareness and advanced the argument of medical cannabis thanks to current and ex-fighters speaking out, and even being prepared to defy the rules to do so.